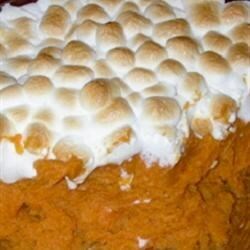 "Chopped sweet potatoes are baked with brown sugar, caramel topping and butter, then finished with a layer of roasted marshmallows." I made this using canned yams (i drained the syrup from them first) and it still turned out wonderful... and even faster to cook! I used canned yams and only half the butter. My family loved them and asked that I always make this for Thanksgiving dinner.